Cereal box base, ribbon from clothes, circles from drinks can newspaper greetings. Clever drinks can bits, and very pretty ones too, very nice. 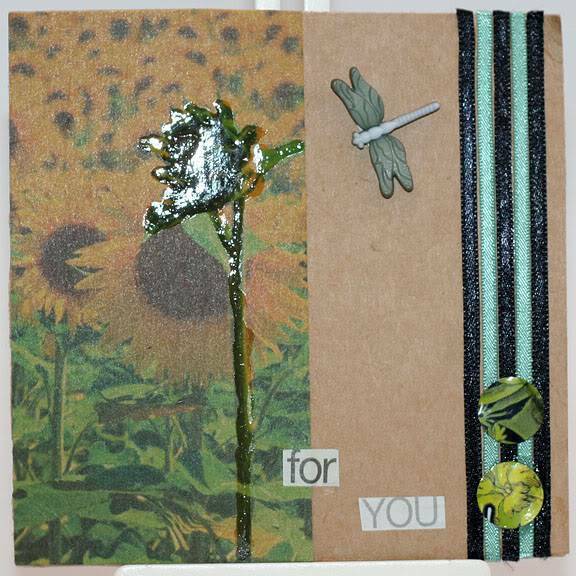 Like the colours you have used in this one Jo, and the circles are fab! Very unusual and I like it very much. I like the circles, too (Lorraine green?). Thought you were going to say the picture was from a magazine - could certainly use one for it. Love the effect of the flower over the top. Love the sunflower pics, so are those actually on a cereal packet or is it paper? its lovely anyway. I keep forgetting about drinks can. I've an old coke can at my feet as I type, had it there two years LOL, can't seem to bring myself to cut it, worried I cut myself. If you put it through the big shot does it leave a rounded edge. Lovely card and use of everything. How have you done the flower Jo? Very unusual Jo , love the circles. It looks awful!! The shiny mess is actually DG over a sunflower to highlight it. Maria the sunflowers are the inside of a Graze box. THey always have fabulous pictures in them. I apologize to whoever gets it. Yes, sorry about that pic. I meant to say that it was DG and does look really nice irl. Soz, Jo. Nice use of our throw-a-way household rubbish. No one would believe what it was made from. DG is Diamond Glaze i think Nona.